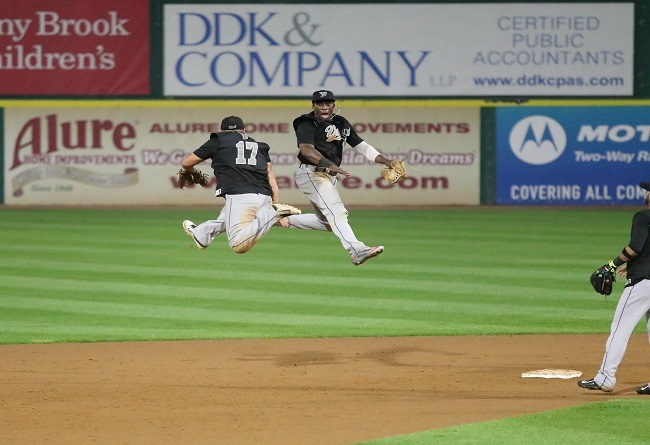 (Central Islip, N.Y., Sept. 27, 2017) - The York Revolution held on to outlast the Long Island Ducks, 8-7 in Game One of the Atlantic League Championship Series on Wednesday night at Bethpage Ballpark, taking a 1-0 lead in the best-of-five series. The game featured three ties, four lead changes, and at four hours and 18 minutes was the longest nine-inning contest in Revolution history. The teams used a combined 13 pitchers, eight of whom worked less than one full inning. Each of York’s first five relievers worked less than one inning until closer Chase Huchingson entered to record the final five outs. York out-hit Long Island 12-6, but the combined 18 hits were overshadowed by a combined 20 walks in the game. York struck early as Alonzo Harris walked on four pitches to begin the game, stole second, and scored on a Jared Mitchell RBI single to right-center, giving the Revs a lead two batters into the contest. Mitchell and Rubi Silva set the table with singles to lead off the third, and with one out, Michael Burgess slammed a three-run homer to left, ballooning the lead to 4-0. It was his second homer of the postseason, and second in as many contests. Revs starter Jay Gause cruised through the first four innings, but ran into one-out trouble in the fifth as Delta Cleary, Jr. doubled, Anthony Vega walked, and Dan Lyons drove in both runners on a double to left-center, cutting York’s lead to 4-2. Reliever Joe Van Meter entered for Gause who was lifted after 4.1 innings, and after a walk to Giovanny Alfonzo and a groundout of Elmer Reyes, allowed a two-run single to left by Lew Ford as the Ducks came all the way back to tie it at 4-4. Luke Westphal struck out left handed hitters Marc Krauss and Angelo Songco in the sixth, but Alex Burg worked a two-out walk from right-hander Michael Click, stole second, and scored on a Cleary single to give the Ducks a 5-4 lead. The lead was short-lived as the Revs rallied in the following inning, also after having their first two batters retired. A pair of walks and a Telvin Nash hit-by-pitch by reliever Dustin Richardson loaded the bases with two outs, and Isaias Tejeda took a bases loaded walk from Matt Marsh to force in the tying run. Travis Witherspoon ripped an RBI single up the middle to give the Revs a 6-5 lead. A free pass proved costly again in the bottom of the seventh as Lyons reached on a leadoff walk and advanced on an Alfonzo sacrifice bunt. Revs reliever Jake Ezell retired Reyes on a comebacker, but Ford chopped a two-out RBI infield single behind the pitcher’s mound, tying the game again at 6-6. The Revs again responded, plating the decisive two runs in the eighth. Ryan Dent walked to lead off and Chase Simpson reached on a bunt single. Harris laced an RBI single to left, plating Dent for a 7-6 lead. Silva added a one-out RBI single to center for a crucial insurance run. After retiring Songco on a broken bat line out to strand two in the seventh, righty Grant Sides remained in for the eighth and set down Burg on a ground out. A pair of walks followed, however, and Huchingson was called upon with one out. A walk to Lyons loaded the bases and Alfonzo lofted a sac fly to right to make it a one-run game, but Huchingson retired Reyes on a fielder’s choice to strand two, and made it a five-out save with a perfect ninth against the heart of the order, securing the grueling Game One victory. York lefty Frank Gailey starts Game Two, opposed by Long Island southpaw Jake Fisher at 6:35 p.m. on Thursday night, before the series shifts to York for the remainder beginning on Friday.